Corporate Clean Property Services has many years of experience in providing cleaning services for building projects, shop fit-outs, and construction sites. We have a proven track record in providing flexible and efficient services to ensure that new building projects are cleaned during the construction, and that the all important project completion hand-over to your client is to the highest standard of presentation. We have dedicated teams who specialise in construction site cleaning and have a good understanding of the needs of the construction industry (including OH&S). 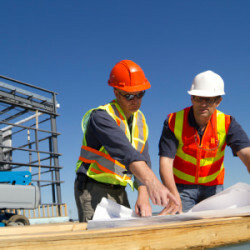 All our staff have white cards and wear the appropriate clothing for building project sites. Construction sites are amongst the harshest environments to maintain and clean. These building areas can have as many as 1,000 workers on site at one time and are often comprised of general office space, toilets and washroom facilities, lunchrooms or crib huts, change rooms, first aid rooms, meeting rooms, showers and more. Corporate Clean Property Services has extensive experience in tailoring cleaning solutions for these construction site facilities, and can provide you with a cost effective solution. Corporate Clean can also provide competitive rates for companies who utilise our services on an ongoing basis for their building sites, as efficiencies are maximised, and we become familiar with the projects or fit-outs. Corporate Clean Property Services has many years of experience in providing cleaning services for building projects throughout each phase of the project including shop fit-outs, and construction sites. We have a proven track record in providing flexible and efficient services to ensure that new building projects are cleaned during the construction, and that the all important project completion hand-over to your client is to the highest standard of presentation. Quite often building projects and fit-outs have very tight deadlines, and can be running behind schedule, causing the final cleaning process to become financially inflated, due to cleaning areas multiple times. One of the secrets to managing the building site cleaning process during any construction project is to get your cleaning services on board early in the process. Working with Corporate Clean from the start will allow us to help ensure that the costs are minimized and the standards for cleaning are high. Let Corporate Clean Property Services take control of the cleaning process during and at the very important final presentation stage of your building project. Call us today for an obligation free quotation.